Dr. Adams generally prefers to save a tooth rather than extracting it although there may be certain situations where an extraction is indicated. A tooth extraction is the removal of a tooth from its socket in the bone. Tooth extractions are becoming less common because of the trend for the smile makeover and beautiful natural smiles. It is usually more expensive in the long run to extract a tooth because in many cases, something would have to replace it such as an implant, bridge or denture. There are situations where an extraction is indicated if there is crowding or wisdom teeth that are causing pain. 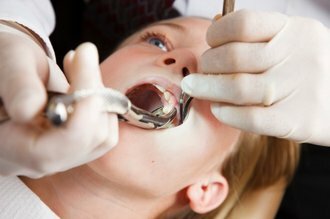 This is a simple dental procedure but it can often cause a lot of anxiety for some patients. Being better informed about the extraction procedure and what to expect afterwards can often relieve some of this anxiety and help you to be better prepared for the treatment. Dr. Adams provides this service for simple extractions but usually will refer complex cases such as wisdom teeth to an oral surgeon who specializes in this type of surgery. Trauma to the tooth following a knock to the jaw from a sporting injury or fall. Deep decay or severe gum disease in a tooth. Not enough space for the teeth. In some cases, extraction may be the only treatment option available however in other cases, alternative treatment options may be available. Dr. Adams will discuss any alternative treatment options with you prior to any extraction. TOOTH EXTRACTIONS CAN BE DIVIDED INTO TWO CATEGORIES: Simple Extractions and Surgical Extractions. These are extractions performed on teeth that are visible in the mouth. Dr. Adams evaluates and discusses the options with the patient. Depending on the case, he may do the procedure in the office or refer the patient to an oral surgeon. It could be a simple and quick procedure while sitting in the chair after receiving anesthesia.Pressure is applied to the tooth to loosen it within its socket. Once it is loose, forceps are applied and the tooth is loosened further and removed. Sometimes these extractions can occur before the patient realizes the tooth is out. In more complex cases, the patient will be sent to an oral surgeon who may provide a sedative that will relax the patient enough to fall asleep while the procedure is completed. This is usually the case of impacted teeth and wisdom teeth removal. In some cases, the tooth may fracture during the procedure in which case the dentist may need to remove the remaining fragment separately. This can sometimes be performed non-surgically, but at times a simple extraction may turn into a surgical extraction. In some circumstances, the dentist may choose to leave the fragment in place. Simple extractions may, on occasion, also involve the division of the tooth into parts prior to extraction to help the tooth come out more easily. The patient feels a lot of pressure in the area as the tooth is being extracted but generally does not feel any pain. There may be some jaw discomfort from keeping the mouth open for a long period of time but frequent opportunities to rest the jaw during the procedure tends to minimise this discomfort. Your dentist will ask you not to rinse or spit on the day of the extraction as this can lead to early loss of the blood clot and delay the healing process. Smoking on the day of extractions and the days following can also lead to early loss of the blood clot and to a condition known as dry socket where normal healing is interrupted. A patient can generally eat normally on the day of the extraction but in some cases a soft diet may be required for 24-48 hours following the extraction. To help prevent infection, your dentist might also ask you to rinse with warm salt water several times a day for 4-5 days starting the day after your extraction. If you have private health insurance, it may cover some of the cost of your extraction but it is always best to contact your insurance company first. Surgical extractions are those that are performed on teeth that are not easily accessible, such as when teeth are broken under the gum line or only partially erupted. Wisdom teeth removal is also generally a surgical procedure as these are often removed if they are still below the gums. Dr. Adams will refer his patients to an oral surgeon who has specially training in these kinds of surgical extractions. This procedure can be performed either under local anesthesia while the patient is awake or under general anaesthesia. Whether the procedure is performed under local anaesthesia or general anaesthesia will depend on patient and the doctor. Surgical extractions involve an incision made to the gum and may or may not require the removal of bone surrounding the tooth to provide access to the tooth. The tooth is then removed in a procedure similar to a simple extraction. Sometimes the tooth may also need to be divided into parts to allow it to be removed more easily. Once the tooth is removed, the gum will require sutures to keep it in place as it heals. Recovery time following a surgical extraction can vary greatly but is generally longer than a simple extraction. There is more likely to be some swelling and you are more likely to need to limit your activities (eg take time off work) for at least the first 24 hours following the surgery. This can not be stressed enough. Patients oftentimes feel really good afterwards and end up causing complications because they didn't take it easy. Instructions for aftercare are generally the same as for simple extractions but a soft food diet and pain relief is more likely to be required for a few days following the extraction. Full healing is also likely to take longer, particularly if there has been bone removal. Remember, if you can avoid taking pain relievers or take them for the very least amount of time, your recovery will be faster. The cost of a surgical extraction can vary widely depending on whether it is performed under local or general anaesthesia and whether bone removal or tooth division is required.It is best to make your inquiries about insurances and the finances with the oral surgeon's office manager. Are there alternatives to extracting my tooth? Any dental extraction should be preceded by a discussion with your dentist about the possible alternatives to extracting the tooth. What will happen if I choose not to extract the tooth and decline any other treatment? The option to do nothing at all and the possible consequences of this should also be discussed. If the tooth is infected and causing pain, this is likely to persist and worsen and may lead to possible spread of the infection which may be life threatening. On the other hand, a tooth which is not infected but which is causing crowding may possibly be left in place. Each situation is unique and should be discussed with your dentist. What are the options for replacing the tooth following extraction? Once the tooth is removed, you may or may not choose to replace it with a prosthetic tooth. The choice not to replace it may have consequences and these should be discussed with your dentist. Furthermore, there is a range of replacement options, each with their own risks and benefits and these should be discussed. How much will the procedure cost? The expected cost of the extraction should be discussed.